Starbucks Gourmet Coffee: Personally I’m a big fan of the Christmas Blend. Have a golf lover in the family? 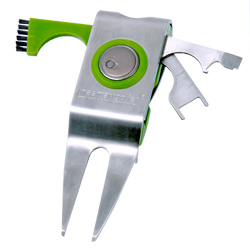 How about this neat “Smart Divot Tool:” its the golfer’s equivalent to a Swiss army knife including divot repair, spike remover, groove cleaning brush, and ball marker. Have a sports, music, or comedy fan? How about tickets to a great game or show? Just a few thoughts from Code 451…I hope my fiance reads this!